Early real estate promotional map or Omaha, Nebraska. This is a separately issued 1887 Adin Mann city map or plan of Omaha, Nebraska, one of the earliest obtainable maps of the city. This map depicts the booming city from Wadsworth Street to Carter Lake and the Missouri River and from just north of Fort Omaha to the Albright's Choice neighborhood (around today's Monroe Street). Myriad neighborhoods are identified, with various streets labeled as well. Certain streets will be familiar with Omaha's current residents, including Dodge Street, Farnham Street, and Leavenworth Street. Omaha's recognizable grid is present, but the north-south streets are not numbered as they are today. The Union Pacific is a major presence here, with their line and the shops both labeled. Other railroads, such as the Omaha Belt Railway, the Chicago, St. Paul, Minneapolis, and Omaha Railway, and the Burlington and Missouri River Railroad are also identified. Advertisements for the bank are present along the top and left sides of the map, proclaiming their loan services, their interest in investment opportunities, and other services. 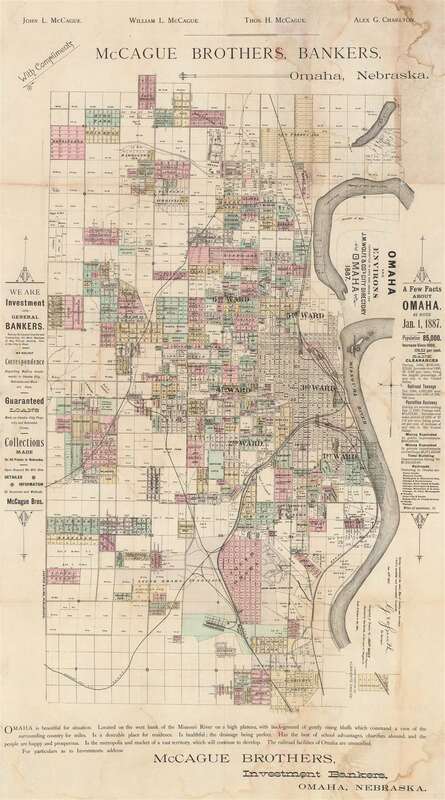 Facts about Omaha as of January 1, 1887, are listed along the right side, including the city's population, banking statistics, railroad tonnage, and the miles of pavement present. A very laudatory statement concerning Omaha's attributes is situated along the bottom. This map was originally compiled and drawn by Adin Mann, who was assisted by George Smith, the County Surveyor of Douglas County. It was then updated for publication in the 1887 edition of J.M. Wolfe and Company's City Directory of Omaha, which appears to have been published by Everts and Kirk. This map is part of four institutional collections in the OCLC, including Yale, Harvard, and the Wisconsin Historical Society. We are aware of two other occurrences of this map entering the private market in the last twenty years. Adin Mann (October 12, 1816 - April 2, 1903) was an American civil engineer and veteran of the American Civil War. Born in Orford, New Hampshire, Mann attended Meridan College in Meridan, New Hampshire, and earned a degree in civil engineering. He moved to Illinois in 1836, where he established himself as the pioneer surveyor of Kane County. Based out of his office in Udina, Illinois, Mann surveyed lands for settlers throughout the county, and was elected County Surveyor in 1842, a position he held for the next forty years. He moved from Udina to Elgin, Illinois in 1842 and held the post of Treasurer of Kane County from 1860 to 1862. In 1862, Mann was commissioned Captain of Company B, One Hundred Twenty-Fourth Illinois Volunteer Infantry, and played a critical role in recruiting and organizing the regiment. He attained the rank of Major before being mustered out of service in 1865. Over the course of his career as a civil engineer, Mann conducted surveys in Ohio, Pennsylvania, Nebraska, and Kansas. Maps of the entire states of Nebraska and Kansas were also made from his surveys and notes. At the time of his death, Mann had been a resident of Elgin, Illinois for twenty years, but over the course of his life he had lived in Batavia, Illinois, Vicksburg, Mississippi (where he ran a lumber business after the Civil War - a position he did not hold for very long), and for a while in Kansas. Mann married Lydia Wright in 1842, with whom he had eight children. Four of his six sons served in the Union Army during the American Civil War. Good. Backed on archival tissue for stability. Soiling. Blank on verso.